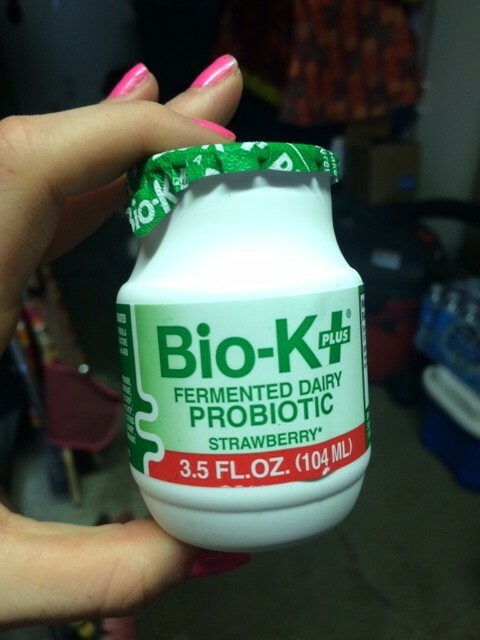 Probiotics are super important in anyone’s diet. They help keep your immune system working well as well as your colon and bowels happy with a healthy flora of bacteria. They are especially recommended for people on Antibiotics a lot, since those medications wipe out ALL bacteria, both good and bad, in your gut, and the good bacteria is NEEDED in order to function properly! 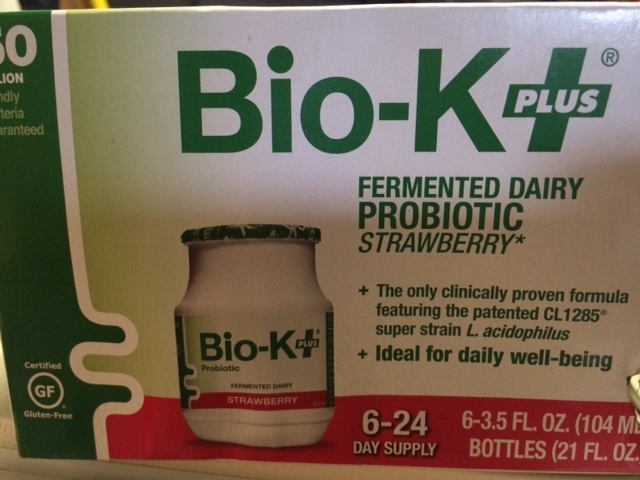 I got Bio-K PLUS Fermented Dairy Probiotic in the Strawberry variety. The package came with 6 tiny 3.5 ounce bottles, each with 4 servings each (or less depending on your personal dosage). The bottle recommends 1/4-1 bottle per day. The recommendation is in rather small letters so I am glad I read everything throughly before consuming, as I definitely would have just had the whole thing at once, like I am sure most people might do (like my mother for example…never reads!!!). 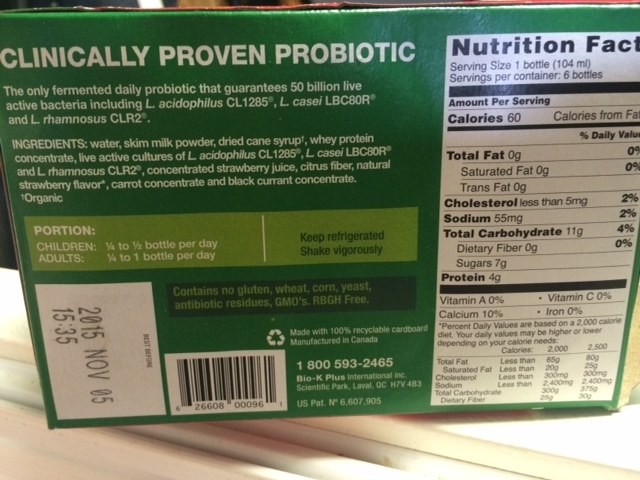 Each bottle is 60 calories, and according to the box, has 50 live billion bacteria! They are gluten free, corn free, GMO and yeast free. You are instructed to shake vigorously before consumption. This I find weird, bc then they should have come with tops that I can close. How am I supposed to shake it later if I am only having half a bottle per day? Anywho, how does it taste? It smells like a strawberry yogurt, but not as strong. The flavor is also strong…it is very tart…but not bad. I would advise taking baby sips of this and now a whole mouthful. It tastes like very tart strawberries, unripened, but the “milky-ness” of the dairy makes it so you do not pucker as you would with the tartness of a sour candy. It has some sweetness to it, which is good, but sour is definitely the predominant flavor. NOT like sour milk sour, more like tart-sour candy sour. It’s an odd flavor…but I kind of like it. Overall, I think this is a good way to take a probiotic. You can get roughly 12 servings out of it if you drink half a bottle per day (or 24 if you drink 1/4). I am drinking half per day, and not peeling the green foil back all the way so I can “reseal” so I can shake it later. The flavor is totally doable for kids too- I would tell them it’s Sour Strawberry flavor so they know to expect a semi sour patch kid flavor with strawberries. Easy way for them to take probiotics, especially those who do not like to swallow pills. I received this item for free. This is an unbiased review. 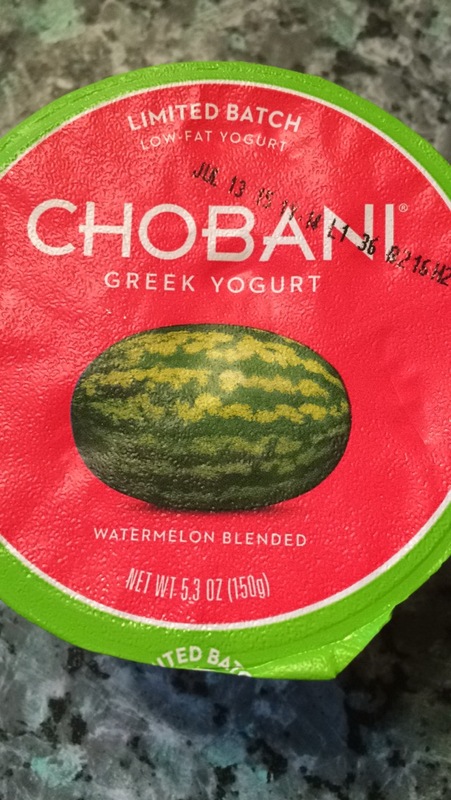 Whilst shopping for my usual yogurts for the week I spotted something new on the shelves…Chobani Watermelon blended yogurt! The pink and green packaging certainly caught my eye amongst the white containers, so I picked it up, and decided to give it a try. Seriously though…look how pretty the packaging is. The yogurt itself was really, really good. 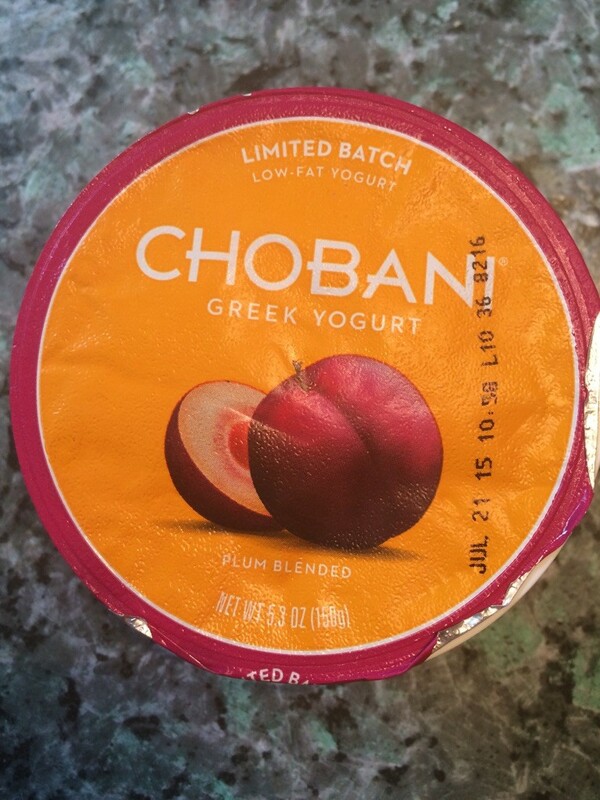 It was super smooth and creamy, and I love Chobani’s 2% yogurts for that reason alone. 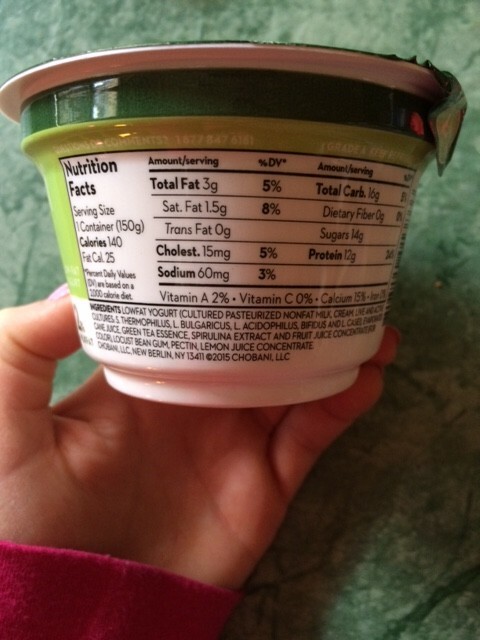 That 3g of fat makes all the difference between a yogurt and DANG that was a good yogurt! It was sweet, but not too sweet, with a sight tang and tartness. I liked this since it was reminiscent of real watermelon- sometimes you get a watermelon that is sugar sweet, sometimes you get one that’s more on the tangy side. Either way it’s enjoyable! I do think there was more of a raspberry/watermelon type flavor than straight up watermelon, which I liked. I could tell it was watermelon flavored, but it didn’t SCREAM watermelon…it had a light flavor. 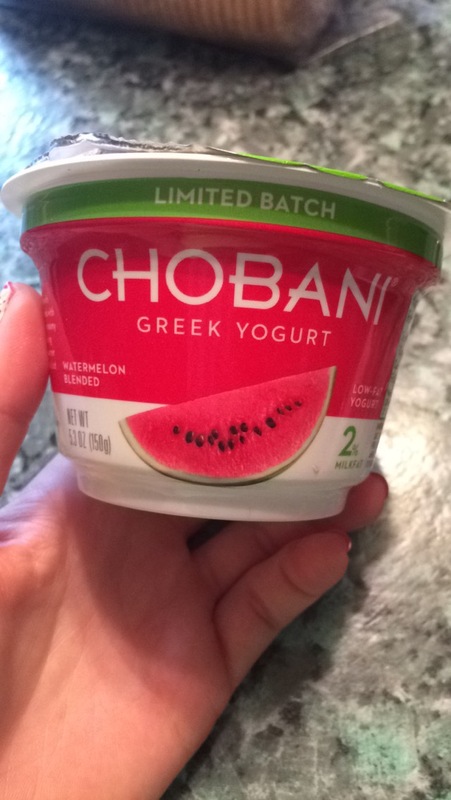 I wasn’t sure how a watermelon yogurt would taste, but this one did not disappoint in the slightest. 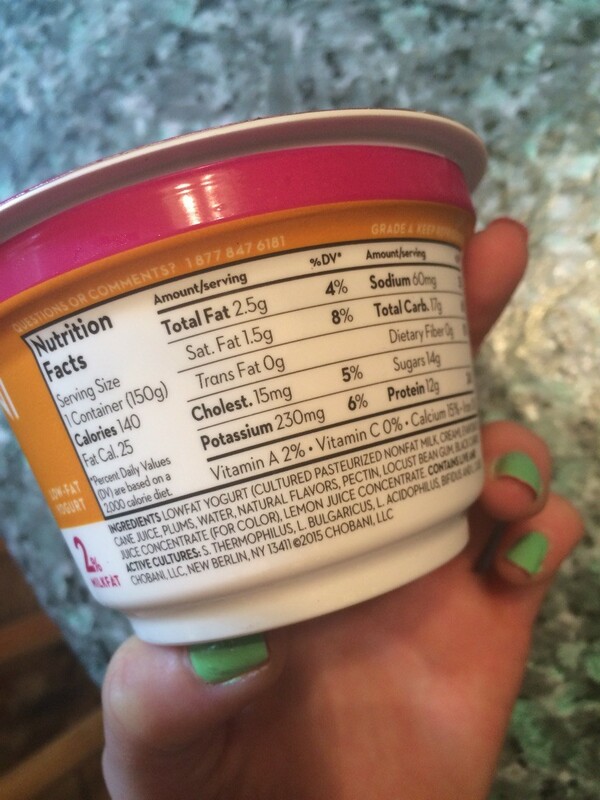 I also like how this yogurt is slightly lower in carbs in comparison to other Chobanis…15 g is perfect for me for a pre workout snack. Found this baby at Target! The colors drew me in…plus I never tried this flavor, so I decided to give it a try! 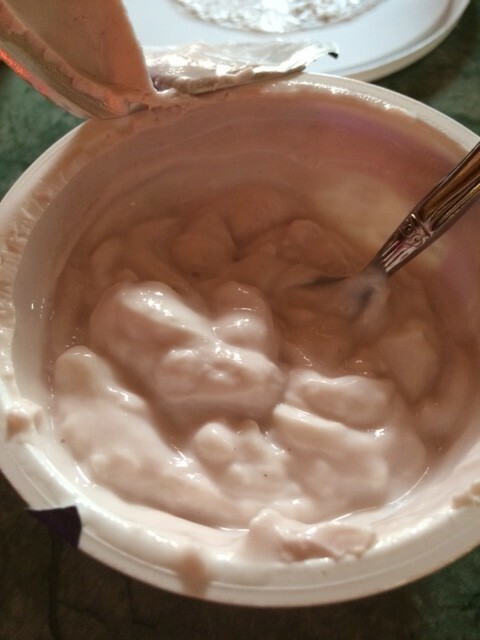 You can see the little bits of plum in the yogurt- not a ton, but still there. Small and soft, like fruit from a fruit cup. 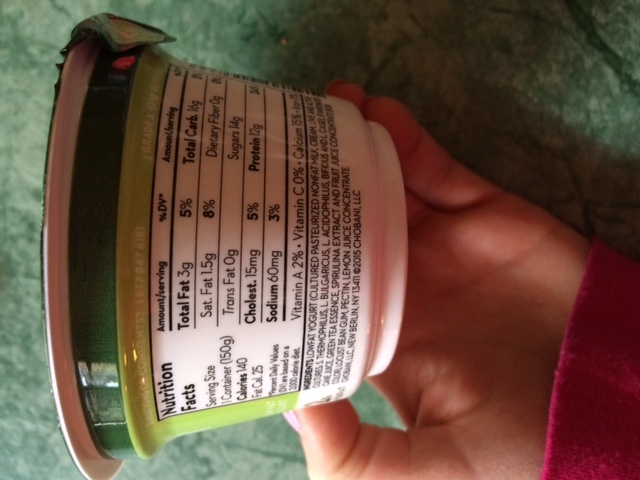 The yogurt was not as thick as I expected, it was like an in-between greek yogurt and low fat non-greek yogurt. 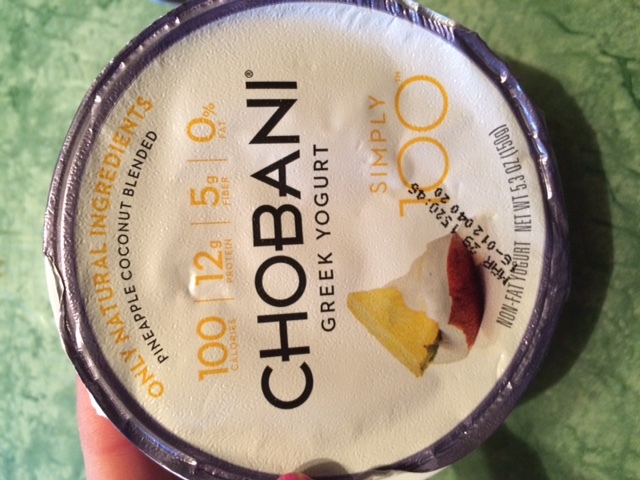 It wasn’t runny, but not as thick as other Chobani greek yogurts I have had. However, it was definitely creamy thanks to that yummy milk fat. It had that tartness that a plum provides but it’s not super tart where you cringe…this I liked! It had a very light flavor, a little sweet, but not too sweet. It was definitely more tart than sweet, but I think it’s a good thing because it gives off a natural plum fruit flavor and not a fake plum flavor (which, it’s made with real plums so, I would hope so! )Overall, it was a good yogurt. Don’t know if I would go out of my way to buy it again, but wouldn’t be opposed to eating it again. 3 1/2 stars. 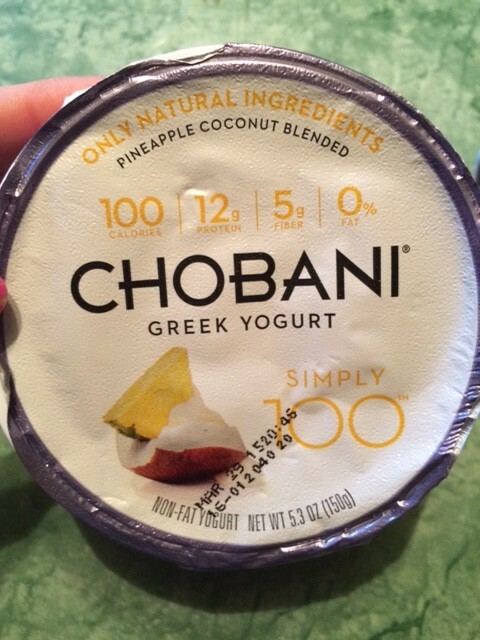 So I’ve seen these Simply 100 yogurts on the shelves from Chobani, and they appeal to me, since they are lower in carbs and sugar. I am a Diabetic, so I try to limit the amount of carbohydrates I consume. 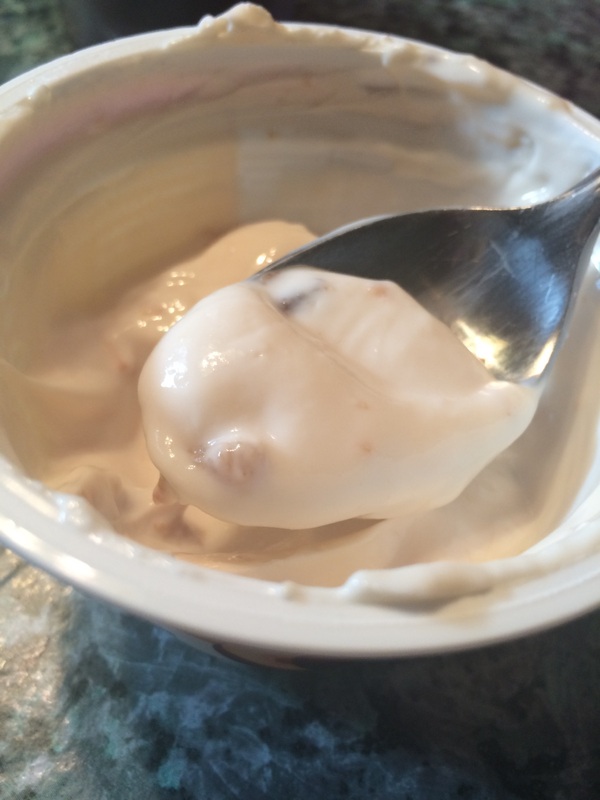 You can see it’s a bit “milkier” than typical Chobani. 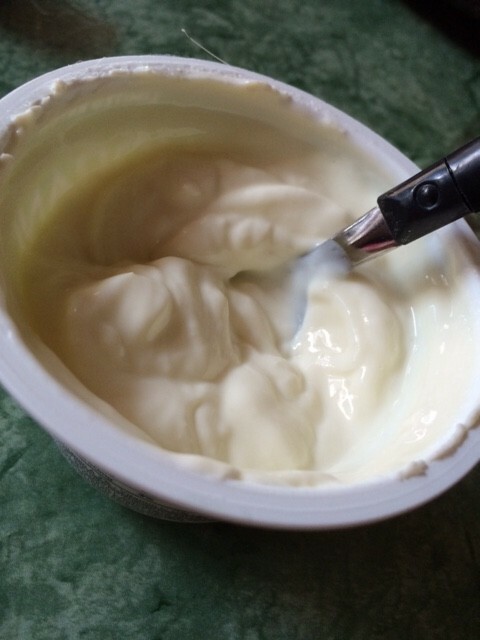 I’m used to that firm greek yogurt on top when I take the lid off, looking all smooth and perfect, until I stick my spoon in it that is! Either way, they could probably get away with renaming this Apricot yogurt. 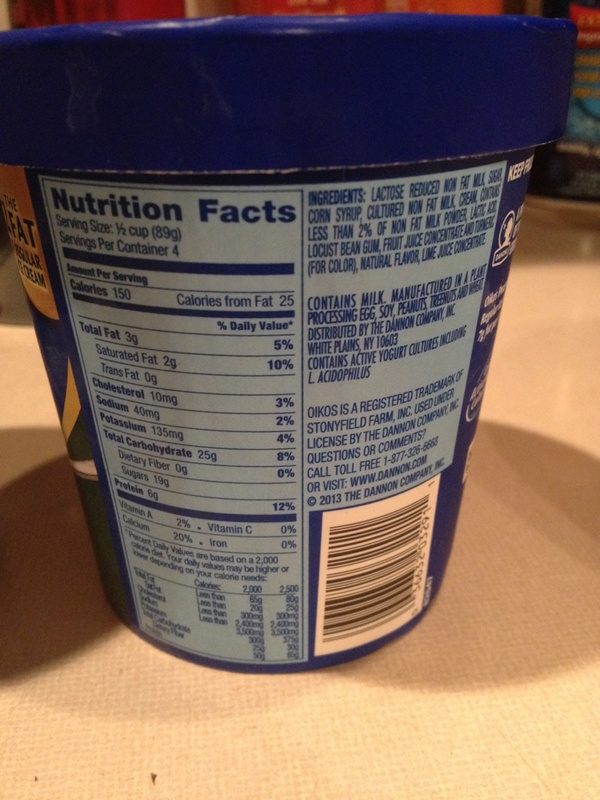 I noticed some evaporated cane juice was added, but not a lot, seeing as only 6 grams of sugar, and some of that sugar is natural fructose from the peaches and lactose from the yogurt itself. So 6 grams of sugar? Good. Tart peaches? Not so good. 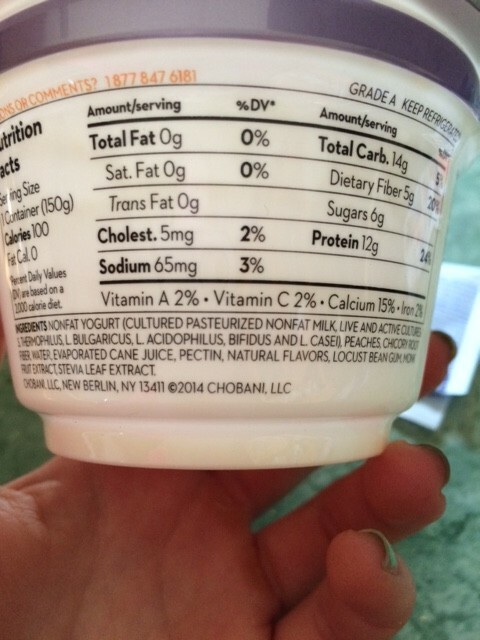 On the bright side, quality is always there for Chobani. Real fruit, fresh fruit, and fresh fruit often means seasonality comes into play. However, I think there should be a bit of tweaking with the sweetener to peach ratio, as these dang things were TART! 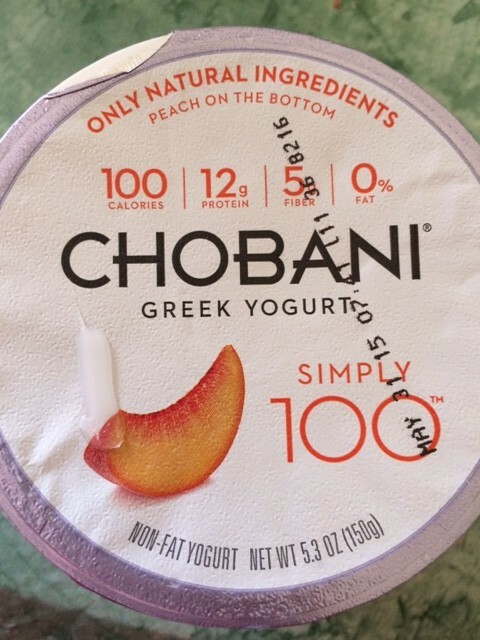 I might try it again…but then again I might just stick with the original Peach Chobani and eat the extra 40 calories. So whilst purchasing my weekly dosage (yes, dosage) of greek yogurts, I spotted this new gem on the shelf. 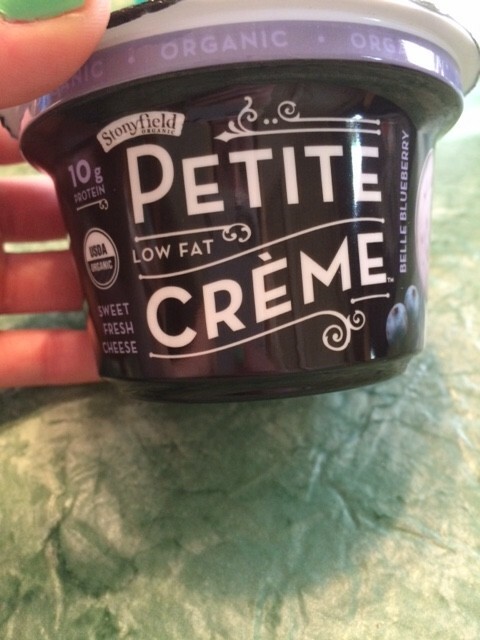 I used to be absolutely obsessed with regular Stonyfield Farm yogurts for years…it was my go snack. 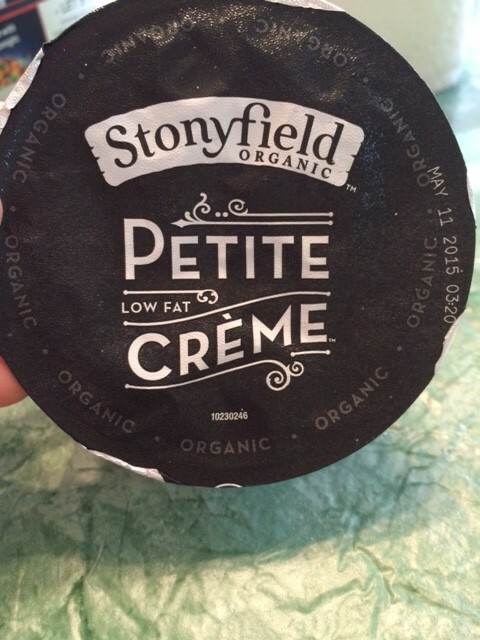 I since then moved onto greek yogurt, but Stonyfield Farm will always have a place in my heart. So I saw this Stonyfield Organic yogurt on the shelf and decided to give it a try. 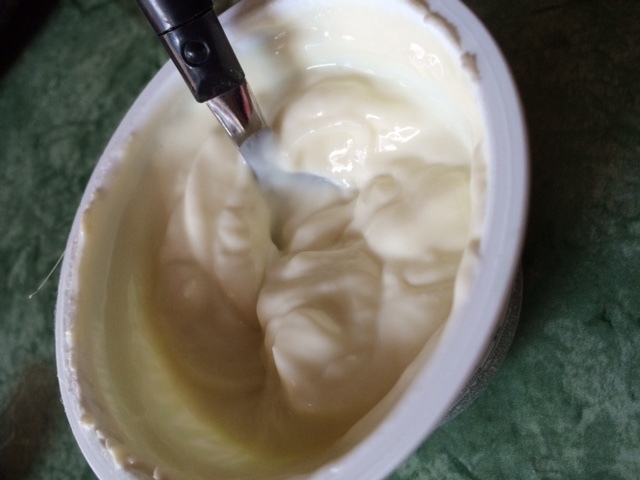 It’s made with “sweet fresh cheese” which can be off-putting I think as a label to people who don’t eat a lot of cheese or yogurt, but, yogurt lovers can appreciate it. 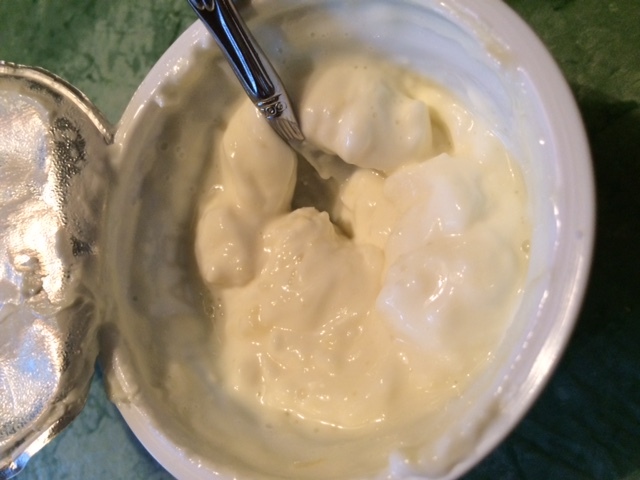 The consistency is halfway between a thick greek yogurt and a more runny regular yogurt, a hybrid if you will. The Belle Blueberry in flavor, however, is quite exquisite. 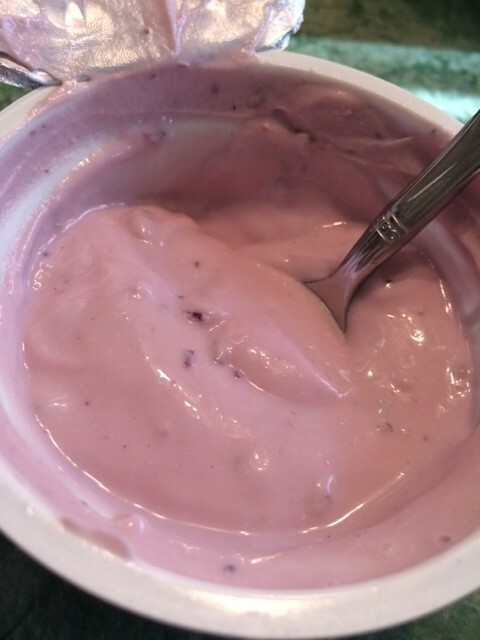 A gentle, “real” blueberry flavor, and mild sweetness, but a beautiful cream flavor pervades the yogurt. 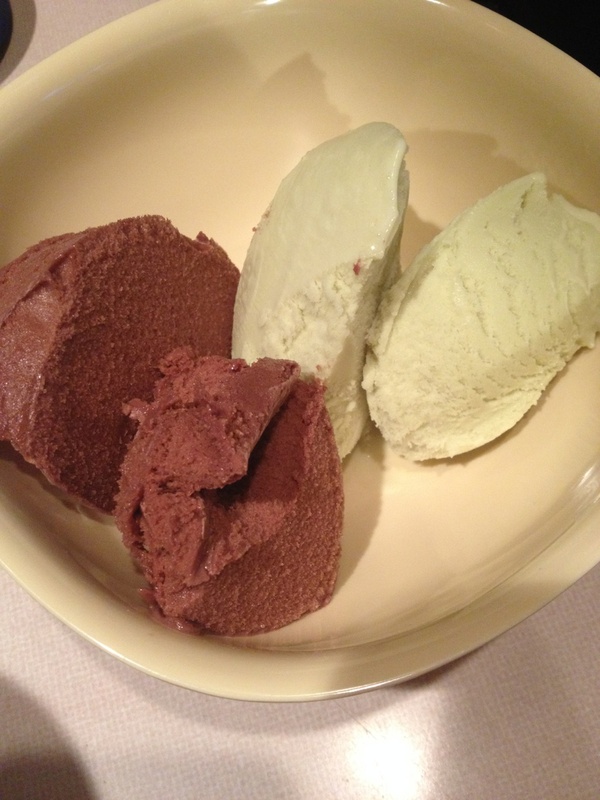 Only 2.5 grams of fat too, which is entirely from the cream, but totally worth it. The flavor is delicious with the blueberry, and gives a blueberry and cream-eqsue feel. Will definitely buy again. I’ll shush my sub-conscious screaming “HEY but this doesn’t have 13-14g of protein!! !” by telling it I will up the egg whites at lunch later on. Problem solved, protein quota hit. I will not be buying this flavor again. 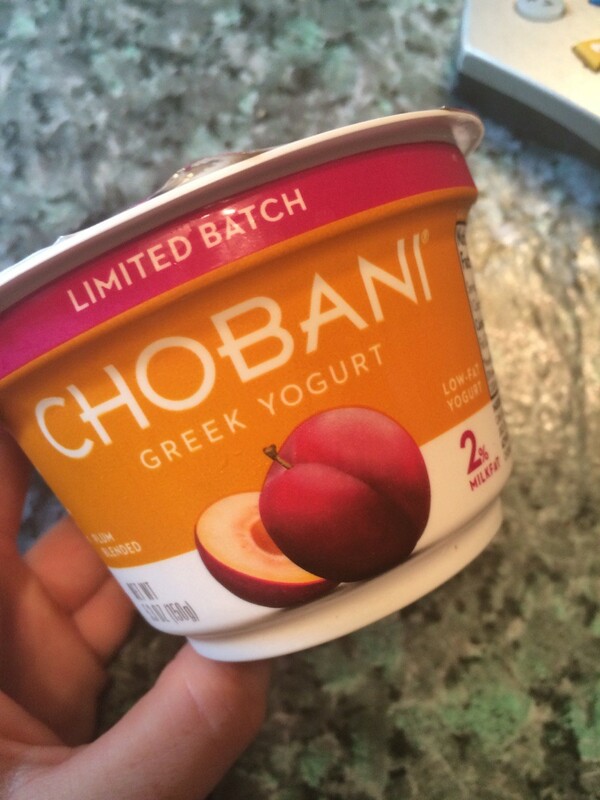 Chobani, you are my favorite brand of Greek yogurt, but the new flavors have been real flops! 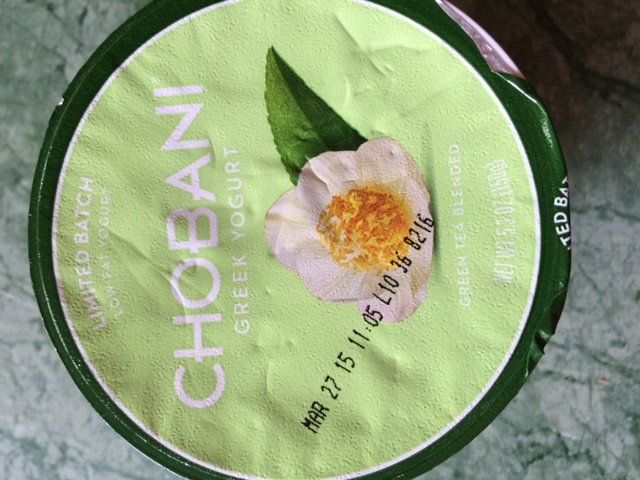 I hated the Green Tea flavored yogurt( which I reviewed here) and this one was a let down as well. Here’s what it looked like. It was a creamy, blended yogurt, so no fruit on the bottom. It was just not sweet enough, or grape flavored enough, or…enough enough. 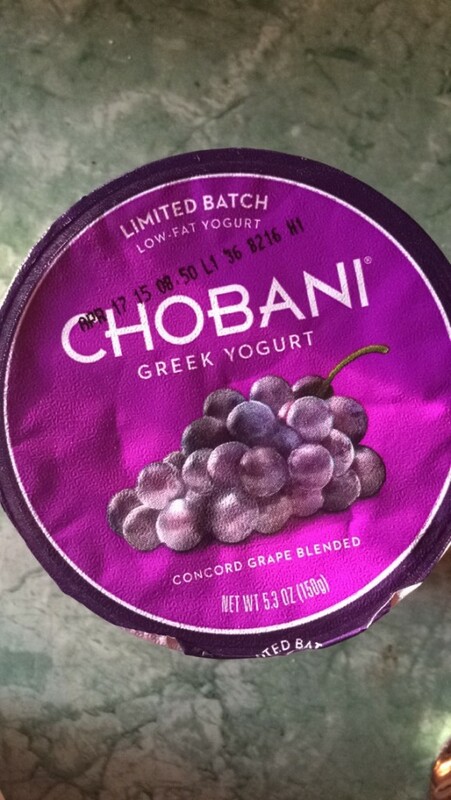 It tasted more like plain yogurt than grape, since the grape flavor was so muted. What little grape flavor there was tasted awfully fake, like a grape flavored candy or something. It had an awkward after taste as well that I could not get over. It was like a few drops of fake grape juice poured into plain yogurt. 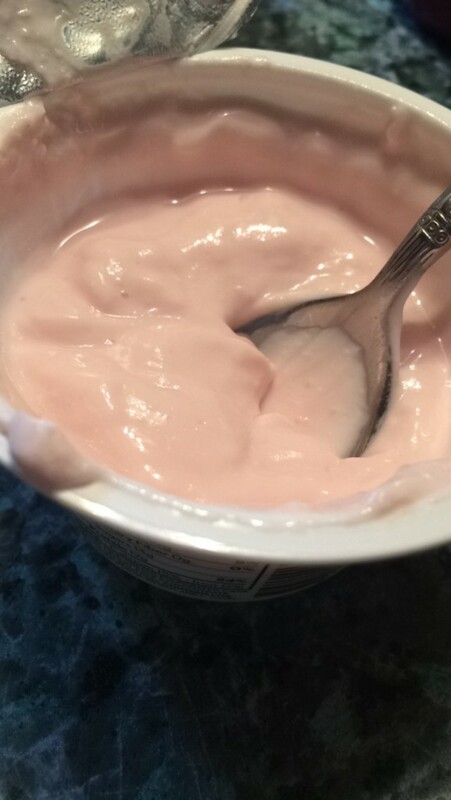 Nothing fancy, looks like a vanilla yogurt. 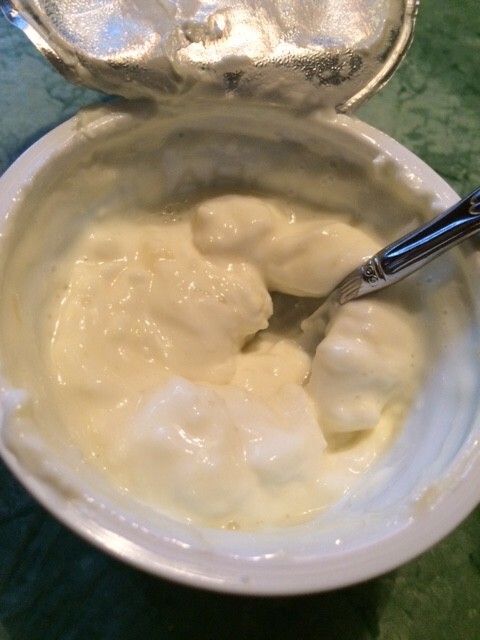 There are few and tiny pineapple pieces in the yogurt as well, but for the most part the yogurt is “chunk” free of fruit. 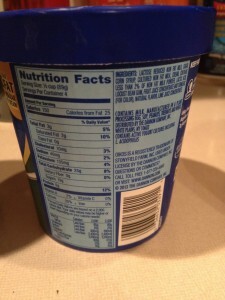 3. was made a 2% flavor, not a non fat. It needs the cream to mask the tartness of the pineapple, which is expected, but too strong. If you’ve been following me for a while now, you know I LOVE Chobani. I have yet to find a flavor I haven’t really liked, and most flavors I thoroughly enjoy. I’ve seen this Green Tea Blended flavor on the shelves for a couple weeks now, so I decided to pick it up. 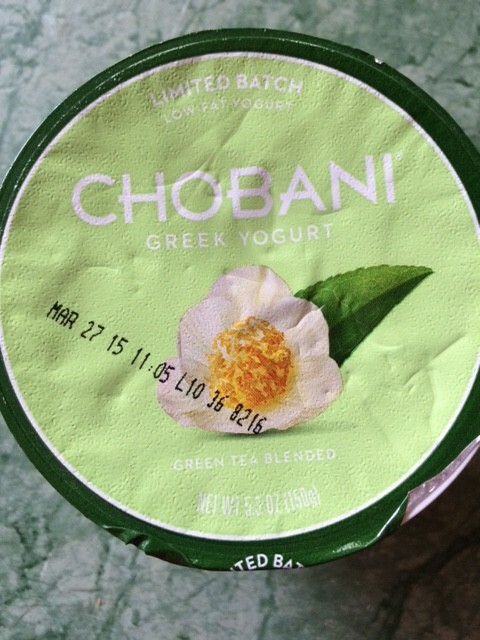 I love green tea, and I love greek yogurt, so why not? It’s gotta be good! Disclaimer: that is NOT a hair on the cup, that is a piece of plastic. Do not fret! Oh boy, was I wrong on this one. 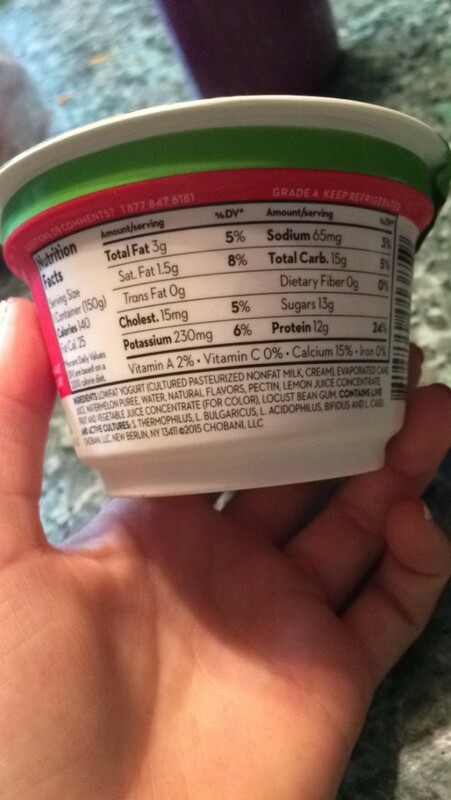 This yogurt was nearly inedible for me. 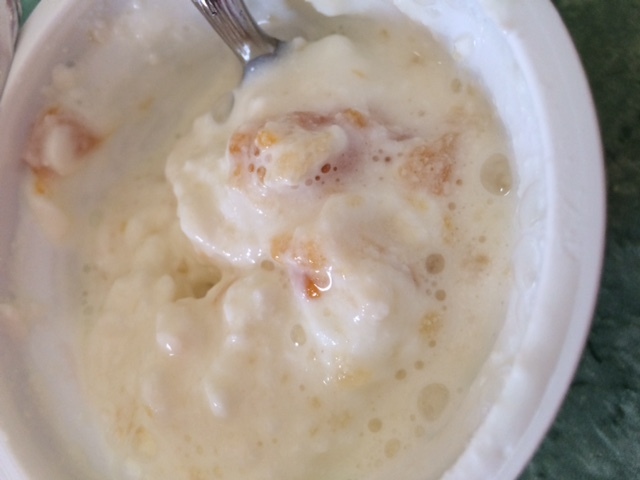 It started off promising, thick and creamy, typical Chobani fashion. Then I actually tasted it…awful. It tasted like plain yogurt, however it had this “cheesy” flavor to it. I had a couple extra bites to make sure, and only after my reluctant 3rd spoonful I finally tasted a very slight green tea flavor. I was NOT. A. FAN. 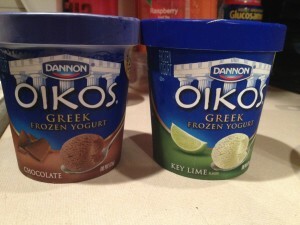 I got two new flavors of Oikos Frozen Yogurt sent to me to try for free for a review. I was certainly excited! I was a frozen yogurt JUNKIE in my freshman year of college. I also didn’t count macros- I only counted calories back then. So I thought it was perfectly acceptable to eat a bowl of frozen yogurt loaded with toppings as long as I stayed in my calorie range (LOL!!). I was also a cardio bunny at the time and barely lifted a weight…oh, what a sad, sad time for me. Haha. If you like cardio, I am not knocking it, I just LOVE weight lifting!! Overall, I like these! The chocolate is the way to go in my opinion. But I would love to sample more flavors! I generally stay away from sweets because of my Diabetes, especially low fat/ high sugar ones like this because of the glycemic spike, but a few tastes every now and then is awfully nice after a hard day at the gym or a sweaty, sunny day. Enjoy your day guys! 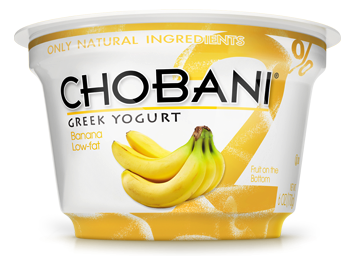 Today’s review, the Banana Chobani. I WAITED AND WAITED AND WAITED for this day to come. I was stoked. The second I saw it on the shelf I bought it, fully knowing I had a drawer full (yes, I store my Chobani in the fridgerator drawer where produce is supposed to go 😛 ) and didn’t need to buy any more. Who cares!? Bought it. Opened the Chobani up with pure excitement. Gave it a taste and…. I just wish it was sweeter. Double edged sword I know, since that would require adding sweetener. But maybe use riper bananas? A different type of bananas? or some stevia? I may try it again, and add a Stevia packet, but I hate having to add sweetness to things that are already sweetened. Mind you I do not eat a lot of sugar (I’m a Diabetic) so don’t think I have an accustomed taste for sweet things.